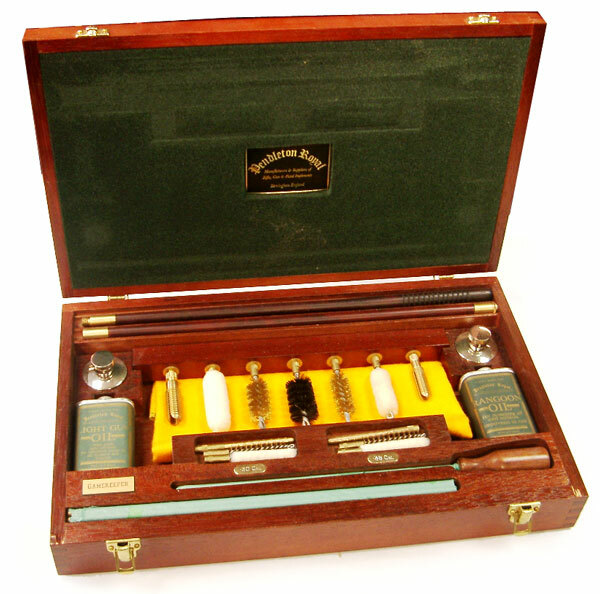 MAHOGANY CASE CONTAINING A TWO PIECE SHOTGUN CLEANING ROD, TWO TRADITIONAL NICKELED ROUND OIL FLASKS, 4.4 FL.OZ. CANS OF RANGOON AND LIGHT GUN OIL, A SEVEN PIECE LIFT OUT BRUSH RACK HOLDS A COMBINATION BRISTLE BRUSH, TWO WOOL MOPS, TWO BRONZE BRUSHES AND TWO BRASS JAGS. A SEPARATE SOLID TWIN COMPARTMENTED INSET ALSO CONTAINS A DELUXE RIFLE/PISTOL ROD, TWO SETS OF RIFLE OR PISTOL BRUSHES AND JAGS AND A FLANNEL DUSTER. SIZE 18 1/4" X 11 3/4" X 3".